Last, but certainly not least, I bring you the DEAN. Dean has resided in Houston off and on since 1998. Before that, he spent most of his life overseas due to his father’s job in the oil business. After completing high school and a taste of college, he joined the Army as an active duty soldier for the next four years as an MLRS (Multiple Launch Rocket System) crew-member. After receiving an honorable discharge, he moved back to Texas and re-enlisted with the Reserves as an MP (military police) for another three years. He began his food and beverage career at various establishments as well as continuing his higher education at the Art Institute of Houston for Computer Animation. After a couple of years, he transferred to the University of Houston to pursue a painting degree. Shortly after he transferred, he found out that he was having a child, well not him but his partner Jacki. His food and beverage history began in a little coffee shop known as Kaldi’s. It doubled as a sandwich shop and the only non-commercial cafe in Huntsville, Texas. Like many things in Huntsville, it no longer exists. Fast forward a bit to a time of extra hot lattes, upside-down caramel macchiatos and burnt coffee. Dean spent two and a half years grinding that little, green siren’s beans. He took many things from that time, specifically how to expedite long lines and what not to do with an espresso machine. The next stepping stone took the form of a small, off the beaten path cafe with religious undertones. Taft Street Coffee is where he first began meeting the people that would have lasting effects in regards to the type of Barista he would become. A coffee shop inside a church provided a well of interesting experiences, some good and others, not so much. In the end, the space worked it’s way into a lot of people’s lives. Dean began his employment at Paulie’s in November 2011. His current position at Paulie’s is Beverage Director and Assistant Manager which makes him the individual who is responsible for Paulie’s tasty beer, wine and coffee selections. While at Paulies, Dean was shortly employed at other well known Houston shops. 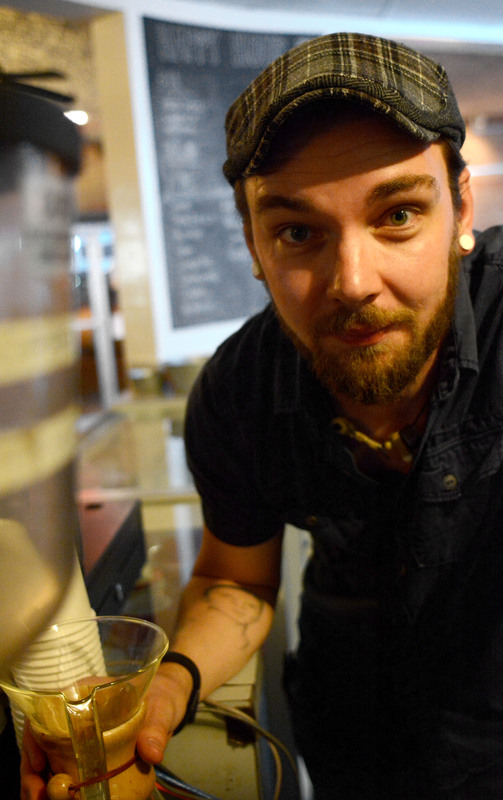 He bartended and crafted coffee at Double Trouble in Midtown under the Robins. He was also part of the opening crew at Blacksmith which is housed in the old Mary’s location. These employment opportunities also added to his knowledge of coffee beverages. This entry was posted on Saturday, June 28th, 2014 at 1:25 pm	and posted in Uncategorized. You can follow any responses to this entry through the RSS 2.0 feed.